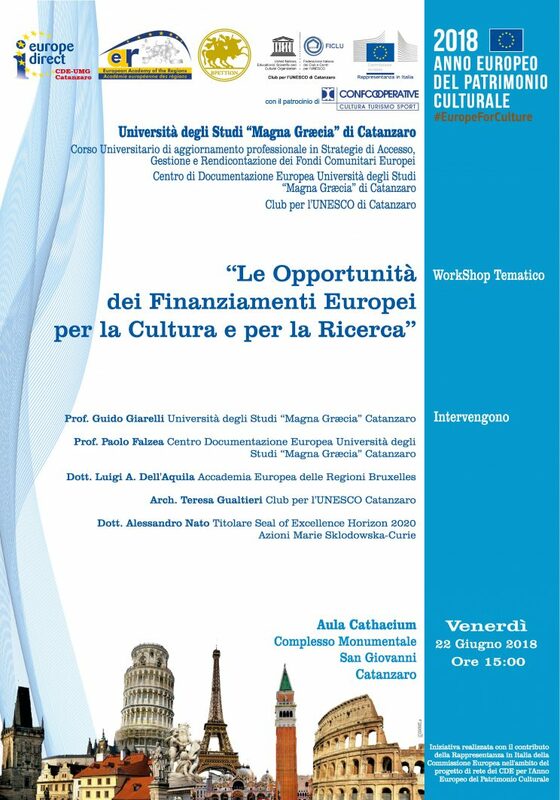 In the context of the European Year of Cultural Heritage (2018), the University of Studies “Magna Graecia” of Catanzaro (Region of Calabria, Italy) – as part of the University Professional Update Course in “Strategies for Access, Management and Reporting of European Funds” – and the European Documentation Center / Europe Direct of Catanzaro set up at the University itself and belonging to the Network of Italian CDE coordinated by the European Commission Representation in Italy intended to organize and promote the Thematic Workshop “The Opportunities of European Funding for Culture and Research”. The event – also realized in partnership with the European Academy of the Regions of Brussels, in collaboration with the Unesco Club of Catanzaro and with the patronage of National Confcooperative / Federcultura of Rome – is scheduled at the Cathacium Hall located within the Monumental Complex “San Giovanni” of Catanzaro, Friday 22 June 2018. The Initiative will start with the Institutional Greetings of Guido Giarelli (Scientific Director of the University Course of Professional Update in “Strategies for Access, Management and Reporting of European Funds” activated at the University of Studies “Magna Graecia” of Catanzaro) and Paolo Falzea (Director of the European Documentation Center / Europe Direct of Catanzaro established at the same University) and provides for the speeches of Teresa Gualtieri (President of the Unesco Club of Catanzaro) and of Luigi A. Dell ‘Aquila (Head of the European Funds Department of the European Academy of the Regions of Brussels and Owner of the Knowledge Management & Intellectual Capital Consulting and Training Agency operating in the European Policy, Programs, Projects and Funding Sector) and the Testimony by Alessandro Nato (Holder of the Seal of Excellence obtained at the end of the Research Project by the title “European Union Social Citizenship: from the Economic Crisis to EU Cross-Border Welfare” carried out at the National University of Ireland in Dublin and funded under the “Horizon 2020” European Program / “Marie Sklodowska-Curie” Actions, by the European Commission).